We’ve decided to use a series of posts to help us sort out the chaotic statistics that we’re finding as we try and figure out what’s going on in the publishing industry these days. Our goal right now is to try and figure out what is really going on with eBooks. The publishing industry is clearly going through a rather significant transformation. More titles are being published each year, yet revenues from publishing are not keeping pace (covered here in an earlier post). Much is reported about eBooks downloaded, but actual numbers are hard to find, and revenues generated from eBooks are even scarcer. 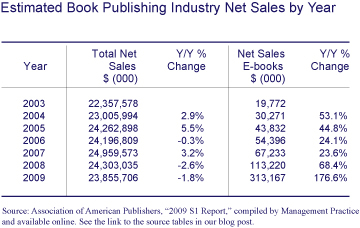 Here are some figures on annual net domestic book sales from the Association of American Publishers, available in their entirety, here. What makes these figures particularly useful is the fact that they span several years and that the Association of American Publishers breaks out net sales of eBooks. The table shows how eBook sales have been growing at a very strong pace, which isn’t surprising as this is a new and emerging product category. However, that segment of book sales, in 2009, represented 1.3% of total book sales… While eBook sales have grown at an impressive rate, we’re still talking about a very small part of the market. That does not exactly match with the sense one gets when listening to publishers talk about eBooks these days. What seems clear is that the attention on eBooks has less to do with their actual sales footprint right now and far more with (1) the potential of this market; (2) technology companies wishing to sell eReaders, (3) publishers having to deal with new distribution systems in an environment that is changing rapidly, and (4) general excitement about what’s new and shiny. Another thing complicating any attempt to make sense of this market is the fact that the figures quoted on eBook downloads are often misunderstood to be book sales. In fact, many eBook downloads are free and thus not sales at all. And, since those promoting eReaders are anxious to have big numbers to report, the statistical landscape is littered with landmines. We haven’t really answered the question that’s implied in the title of this post. We’ll work on that for the next post as we keep hunting for economic statistics that help us see this industry more clearly. Please note that the net sales reported in the table above do not include the sale of self-published works or even some works published by small publishers that are not members of the Association of American Publishers. Also, the figures presented are based on U.S. sales.